If I keep mentioning this horrible, cold, super-snowy Ohio Winter in my reviews, please forgive me. And take pity on those of us who have had to deal with foot upon foot of snow, sagging gutters filled with heavy ice, and bitter wind as we shoveled our way out. It's taking its toll on not just the face, but on arms, legs and especially hands. 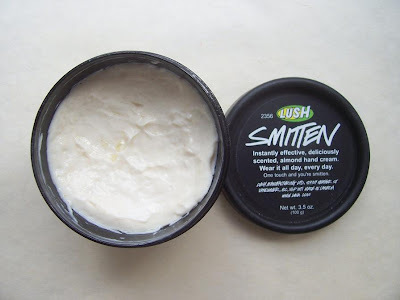 My hands are sore and raw, dry and flaky, and nothing seemed to quench them except for this wonderful tub of emollient hand cream from LUSH, called Smitten. What a cute name! And I am, Smitten that is! Just a dab or two of Smitten is all I need to soothe my dry flaky hands and comfort the soreness after a morning of shoveling the driveway or a day of working around the house, hands in dishwater or cleaning products. It has the most delightful almondy scent, too. With lots of oils and extracts listed in the ingredients, I would consider it more of a treatment product than a regular hand cream product. It does not disappear into the skin readily. It hangs on for a while, so you can continue to smooth it in and re-work the cream into dry patches. I especially like to slather it on right before bedtime. If there's any extra on my hands, it goes right on the elbows and knees. My hands feel refreshed come morning, ready to take on another day of whatever comes my way. This little tub has saved my hands this Winter. When Spring arrives, if it ever does, I will probably stash this tub and go on to something lighter, but for now, it's the go-to jar I can't do without. I purchased this jar of Smitten on the recommendation of Ceil, who knows all things LUSH. She never steers me wrong. The little black 3.5oz jar is $17.95 at the LUSH store, and if you can get out of there with just one item, I salute you. Currently I like to use Lush's Handy Gurugu + Helping Hands during day + Lemony Flutter for my cuticles and finger tips as often as I can. I love Smitten. I am a Snowcake addict and my boyfriend loves the aroma so this lets me enjoy the scent year-round! 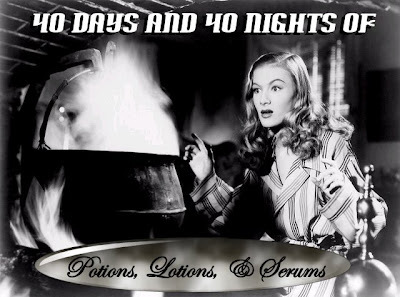 It's also a great formula! Great review, Patti! After all my grumbling about Lush last week, I must say that I love *all* their hand creams... I'm using Handy Gurugu right now, and I'm also a fan of Helping Hands! Smitten has the best fragrance, though.